David Scott was the son of Robert Scott, and brother of William Bell Scott, both involved in contributions for George Thomson’s publications. Like William Bell he also wrote poetry, although he requested many of his verses to be destroyed after his death. Apprenticed to his father, David also attended the Royal Scottish Academy. But the deaths of his four elder brothers in 1807 had a devastating effect on him and his family. This had a strong impact on David’s upbringing and his mind; he grew up a rather melancholy character. 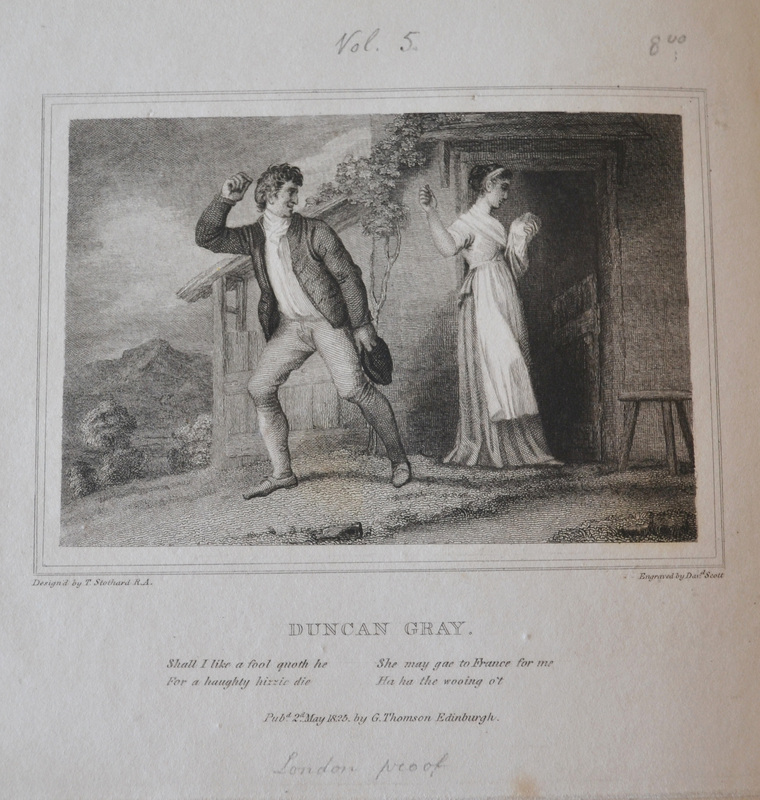 Of the two illustrations for ‘Duncan Gray’ in Thomson’s collections, one was engraved by David’s father Robert Scott, and the other by David himself. They are identical, as both are based on a drawing by Thomas Stothard. David’s appears in the fifth volume of the octavo edition of George Thomson’s collection, dated 1825. 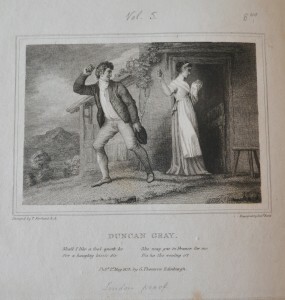 The illustration you can see here is part of a collection of illustrations of Thomson’s publications all bound together – the illustrations were in fact also sold separately. It would appear to be a “London proof” dated 2nd May 1825.